Sometimes I wonder if doing a blog about higher ed social media is a bit of a fool's errand. Actually, I wonder that all the time, mainly because 1) I'm pretty lazy and 2) I'm not very good at the type of click-baity, SEO-writing that - sadly, IMO, which makes me an insufferable snob, I know - actually gets people to read something I post. If you're here, consider yourself among a hyper-selective group of internet denizens... SEAL Team 6 of the #HESM world, if you will. But another reason I wonder if I'm a bit like Templeton after the fair is because higher ed social media is indeed a veritable smorgasbord. Sometimes I think it's impossible to compare smaller schools with understaffed and scrappy social media teams to big research institutions with huge staffs and multiple full-time people doing social media work. But then I remember that social media is about building relationships, telling stories, eliciting emotions, fostering good will, spreading the word... things that by their nature are universal. It doesn't matter if you're one person doing social media part time (like me!) or one of several people working together to represent your institution digitally. We are all in this for the same reasons, and we hold this truth to be self-evident: that all social media pages are created equal. Managed equally? No. But created equally? Absolutely. Social media belongs to all of us, and all of us can use it to make an impact toward increased awareness and affinity for our respective colleges. What does this all getting at? 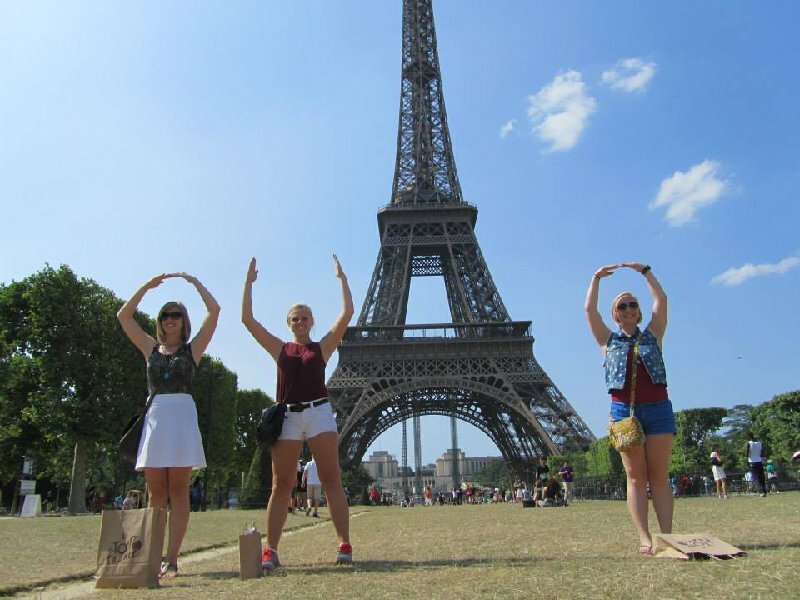 The absolutely brilliant, heart-warming, viral, wonderful, unstoppable Ohio State promotion of getting people to spell out O-H-I-O with their bodies. Babies + Memes? Not even fair. If you ever meet me in person, ask me about my Eiffel Tower story, which ends with me running from French cops and hiding in the bushes of the Japanese Embassy. Good times. I mean... when you take a minute and think about it, is there anything better in social media? At any level - not just higher ed/non profit? Probably more than 50,000 people have posed for photos just to show off school pride. We get excited when even 100 people take one second from their life to bother to share something on Facebook or retweet it on Twitter. Imagine getting 50,000 people to travel the globe and share photos of themselves promoting your school... for free! Truly special. Ohio State has a lot of advantages in terms of getting something like this going. A massive alumni base. A wildly popular football team, that makes people who aren't alumni feel a very strong affiliation with the school. (In fact, this started out as a footbal cheer.) A very large communications department to help manage the influx of photos and promote them. It would be easy for someone like me - small school, small staff, no football, etc. - to throw my hands up and say something like this could never take off at my school. 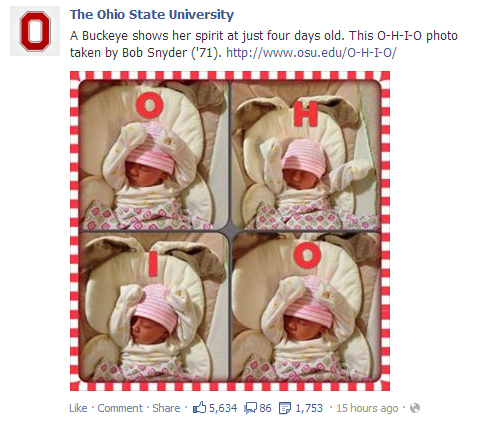 And, sure, it never could to the extent that it has at Ohio State. But that's no reason to give up. There are always ways to get people to take part in something like this. The trick is how to motivate them to do so. And I'm sorry if you came here looking for the answer to that... chances are pretty much 100% that the answer is going to be unique to your institution. But a jaw-dropping project like this is such wonderful inspiration to challenge ourselves to think big, to force ourselves to get out of the engagement rut (Click like if...! RT if...!) and tackle the big questions of truly successful social media - what makes people tick? What makes people's hearts swell with joy and pride? What do people really like, not just what they click like on.